Meet Leadership Program of the Rockies 2015 graduate Dr. Prashant Krishnan, M.D., our October 2017 Alumni Spotlight! 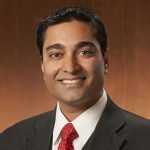 Prashant is a practicing physician and Vice President of Colorado Springs-based Peak Gastroenterology Associates, and also serves on the board of Castle Rock Adventist Hospital. For the last four years, Colorado Springs Style Magazine has acknowledged him as a “Top Doctor” for outstanding work in his field. As an advocate for free market solutions to increasing healthcare costs, Prashant joined the LPR Class of 2015 to hone his skill sets in being an influencer for sound economic principles in the healthcare industry. Prashant continues to remain active with LPR, and is currently a Chairman’s Circle donor.